It is a testament to the legend of Mumbai's Dabbawallahs that even a mistake on their part (less than one in every six million deliveries) results in an outstanding film. 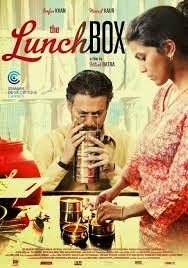 As Lunchbox's Aslam Sheikh resurrects his Ammi and says " Meri maa kehthi thi ke even the wrong train can take one to the right destination". In Maximum City dabbas and trains often go together, and here they take us on a delightful ride where the ending does not matter. So we get an exciting new director- Ritesh Batra who in his first full-length work engineers a cinematic repast in which he blends cinema verite with a warm winsome storyline.The knack lies in his sensitive observations,perfectly natural humour and particularly in his restraint - he thus admirably resists the temptation of emptying the entire kitchen's masalas into this Lunchbox. What surprises me is that Kiran Rao did not manage to get hold of producing this film -her vaccuum is filled by half of all the producers in town - an "Indo-German-French" production as per the credits, UTV, Karan Johar with his Dharma Productions and the done-to-death Kuch kuch hota hai chants, the optimistically named "Dar" films, Sikhya entertainment, ROH films, NFDC etc etc etc. But I missed reading the names of many of the film's contributors during the opening credits - my eyes were riveted on the Dabba's transport mechanism which is simultaneously shown. The lady in the house cooks the meal,places it in the steel multi-decker box and hands it to the Gandhian-dress-sporting Dabbawalla who ties it to his bicycle, takes it to the station where long carriers hold dozens of marked lunchboxes which the train carries to the nearest stop where the offloaded package bobs up and down until it is deposited on the table of the exactly corresponding office-wallah. Temperament-wise, all 3 of these characters are roughly similar, with the same calm behaviour and their immediate circumstances are also united by a creeping tension. Fernandez is a widower who lives alone- he is essentially a good mature-minded man; but the fact that his retirement life will take him out of his comfort zone, coupled with this enigmatic new lunchbox from an unseen woman, infuses an edgy uncertainty into his clockwork world. Ila is a house-wife who also takes care of a young daughter,and when she realizes this switch of lunchboxes, she does not rectify the mistake but is rather excited by this twist in her routine, and it helps to take her mind off the lack of marital dedication shown by her husband. Even when she seduces him with a figure-hugging dress, her husband seems so disinterested in her that we're not sure if even the world's greatest Aloo-gobi will make him take a renewed interest in her. I was relieved that Fernandez doesn't declare on Facebook/Twiiter - "Hmmmm, Yummy lunch everyday !!!" Karan Johar may be one of the producers here, but slicked-up production design is refershingly absent -Ila's apartment is a dreary affair with smudged walls and mofussil windows, the streets in front of their house which her school-going daughter negotiates in order to get to the autorickshaw, is pot-holed with brown puddles and the wall around their building is streaked black with fungus and denuded paint. The inimitable environment of Bombay's local trains is captured inside the cinema theatre -urchins wailing their favourite ballad "Pardesi Pardesi jaana nahi! ", a youngster getting up from his valued piece of real estate after pre-selecting and informing whichever senior he had deemed fit to take his seat, and Fernandez consoling a troubled Ila with a story touching on the differential diagnosis of frotteurism in Bombay's trains . I've glimpsed young Nimrat Kaur over the years on television advertisements,and here she delicately fulfills her dramatic potential. Never stepping on an incorrect emotional note, she gets out of her frowzy housewife mien and is at her beautiful best when sits at an Iranian cafe ,elegantly groomed with a small red bindi, awaiting something more special than the joint's reputed kheema pao. As Saajan Fernandez who actually looks younger and revitalized towards the end, Irrfan Khan emotes with wonderful control and applies such understated "tadka" that he alone threatens to drown all the melodrama in the Hindi film industry. Here embodies the philosophy of a chef who showcases the produce to its best effect with minimal use of spices and condiments. It is an unexpected joy to watch his placid demeanour smoothly perked up by splashes of dry humour, humbling shows of maturity and his leap of audacity. Nikhil Advani faltered in making admirable use of Irrfan in D Day, even the great Ang Lee miscalibrated Khan's portrayal in Life of Pi, but Batra shows us how to channel an actor like Irrfan. Nawazuddin Siddique is magnificent in inhabiting the persona of Aslam - that resilient alacritous type of Mumbai boy who will find a reason to soldier on and smile even if there are terrorist explosions around him and the city's skies have unleashed storms-'n'-floods upon the city. Here he is back to his tip-top Kahaani get-up -hair nicely kempt, face looking sharp and smartly dressed. As an abundantly enthusiastic trainee who gradually overcomes Fernandez's initial resentment to him, and even fulfills a symbolic void in the latter's life, Aslam is so earnest that it is hard to figure out on some occasions whether he is hamming it up to please others. First he comes across a street-smart cloyingly polite operator but his excellent character arc soon makes us realize that his cheery ebullience is a completely sincere force that supercedes his naivete and vulnerability. To watch an early scene showing them both essaying men of two different temperaments, is to witness a momentous interplay between two remarkable character actors of modern Indian cinema. And so it is that in this year 2013- one of the best years ever in Hindi cinema - we get to see the crafting of another select gem - an intimate ,intelligent film that packs unexpected emotional force. No wonder the film won the Cannes Critics Week Viewers Choice award ,besides making a splash at Telluride and Toronto. You don't need songs as long as you are sensitive enough to hear and enjoy the cadences of the film's perspective. Feathers of synchrony flutter into the worlds of Ila and Fernandez just through their act of written communication - both bat away flies as they read the missives, scene transition from his office to her home uses a switch of focus from one whirring fan to another in their respective rooms ,and Fernandez looks up in a surrealistic instant to see the fan slowing down, as though it is mirroring his own skipped heartbeat. Occult wavelengths fill the air when Fernandez gazes out of his autorickshaw and sees that the city has changed while remaining the same - his unspoken running commentary in this regard is addressed to the far-away Ila but the auto-driver turns back and asks softly "Sir, aapne kuch kaha?" And there is that extraordinary scene where Ila visits her shocked mother- there is no false tragedy here -just an intensely uncomfortable outpouring of feelings in plain words - the additional brilliance of this sequence lies in the way a particular repeated sentence, uttered by her mother, carries a disturbing but inspired consonance with the film's title. Writer-director Ritesh Batra ,with his debut full-length work ,thus provides ample evidence of his potential as a world-class film-maker. He is constantly on the look-out for small interesting details that enrich the larger narrative.He does not manufacture an artificial story, rather he is content just letting it assume the natural flow of life. But Batra is obviously smarter than the average Joe, and therefore also knows that sometimes you have to tinker with life in order to get what you want. Moral of the story : Please make sure that your lunchbox (along with the other two meals of the day) has delicious variety. If others let you down, learn cooking by yourself.